Since 1925, Tight Lines Inc.
represents the standard of excellence in Drift Boat fishing and whitewater rafting industry throughout Oregon and Idaho. Our unique driftboats are a very deluxe, dry method of river travel, but most of all their maneuverability allows us to fish every isolated lair in search of "Old Walter". 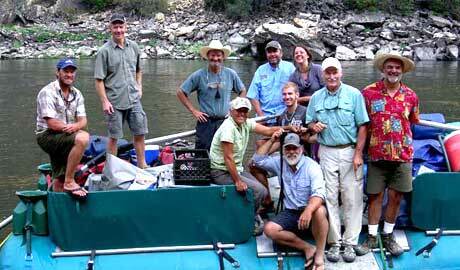 Tight Lines fishing trips feature the "best" Idaho and Oregon fishing guides. Idaho's Middle Fork of the Salmon is truly a dream come true for any fly fisherman. The crystal clear waters are home to a high concentration of West Slope Cutthroat and Rainbow trout very willing to explode from their lair to devour your fly. Believe me, they are not finicky! The Rogue River "Twitch" means steelhead fishing swinging a wet fly! Add that to Chinook or Coho Salmon and you may get a soar arm. From its origin in the High Cascades near Crater Lake, the Rogue River carves its way through Oregon's rugged coastal Mountains to the Pacific Ocean. The Rogue River is a national "Wild and Scenic River". 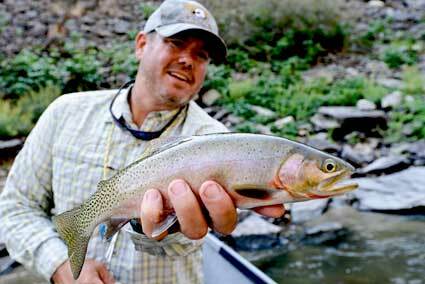 The incredible lure of dry fly fishing for Rainbow Trout! Bubbling from beneath the lava beds in Oregon the McKenzie River originates high in the Cascade mountains and travels 85 miles through towering old-growth forests to its confluence with the Willamette. It's cold crystal clear water drops steeply at first, then flattens as it nears Eugene Oregon in the valley below. Elite fly fishing & whitewater rafting fun for family and friends in the Wilderness of Oregon & Idaho! Whitewater rafting and hot weather go hand in hand! Southern Oregon's Rogue River Canyon is known for it's heat and incredible cooling waves. Our 3 day or 4 day river adventure covers 43 miles of the rivers "Wild and Scenic" section from Graves Creek to Foster Bar. Whether you choose outdoor camping on the beaches or staying in comfortable wilderness lodges your trip will be the highlight of your summer! The majestic Middle Fork of the Salmon River in Idaho will leave you breathless. From dazzling whitewater rapids to precipitous granite walls towering 1500', you will beckon to see around every bend of the 100-mile journey through the most rugged and inaccessible wilderness in the lower 48 states. During our six-day journey you will experience abundant wildlife such as bighorn sheep, deer, river otters or an occasional mountain goat. Beautiful campsites will meet your day's end and quite possibly the soothing waters of a hot spring. The Mighty Salmon, Idaho's River of No Return, is the longest free flowing river in the United States. Our five day Idaho fly fishing & Salmon river rafting journey covers 53 miles of the Salmon and 20 miles of the Snake, beginning near Whitebird and concluding at Heller Bar near Lewiston. Our professional licensed guides are committed to providing each and every guest with personalized attention and care. We are specialists in dealing with all skill sets and we will advise you on how and where to catch the big ones on the best wilderness rivers in the Pacific Northwest. We convey our message of fishing in a relaxing, easy to understand manor that everyone will enjoy. Family FUN and Dry Fly Fishing at its best!!! Steelhead, Chinook or Coho Salmon wet fly fishing. Great for families. "This is as good as it gets. The food was excellent and your company was great. Meandering down the Rogue River and catching Oregon steelhead such as this was a real thrill." Tight Lines offers a variety of trip selections. Whether it be an evening of fly fishing, a day in a paddle or oar-powered raft, or a multi-day campout or lodge trip on a wilderness whitewater river, we know we have something you will enjoy and remember for a lifetime. Our entertaining guides are full time professionals. Most have at least 20 years of guiding experience and several have over 30 years. With this kind of background, we have accumulated ideas the most discerning fly fisher will find helpful. Likewise we have the finesse it takes to give the first timer an experience that makes them want to return. Please take this opportunity to browse through our trip selections and descriptions. Remember we can always design a special trip to fit your specific individual or group needs. We look forward to discussing your next vacation with us. 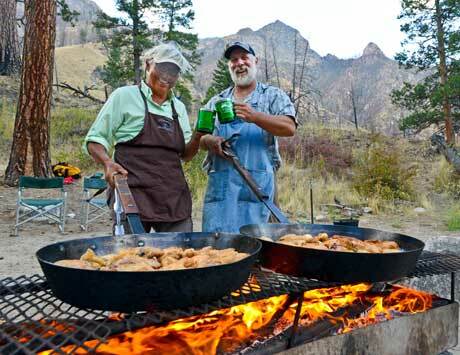 Select your outdoor adventure vacation in Oregon or Idaho. If you want to fly fish your family can ride in a whitewater raft on the same trip.